Below, a random person I spotted in Transylvania two minutes after the grid went back up earlier today. 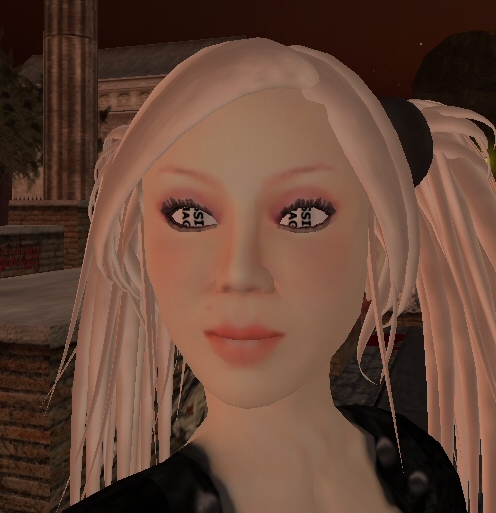 In her eyes, you can make out part of an error message, denoting that a graphic or script from her customised “avatar” or representative form in Second Life is missing. It means that the system, that’s been crashing and hiccuping constantly since an upgrade on Wednesday, is failing to find and/or process the entirety of her body. Elsewhere, I’ve seen people wearing that message over swathes of their skin, projected there by the system. The girl with error-message eyes. links for 2006-09-16 » What Future? Patchwork Earth Codex & bLog » Blog Archive » I fixed my PC sound! GlitchBlog.com » Blog Archive » Error message eyes in Second Life - The videogame tricks and glitches blog.